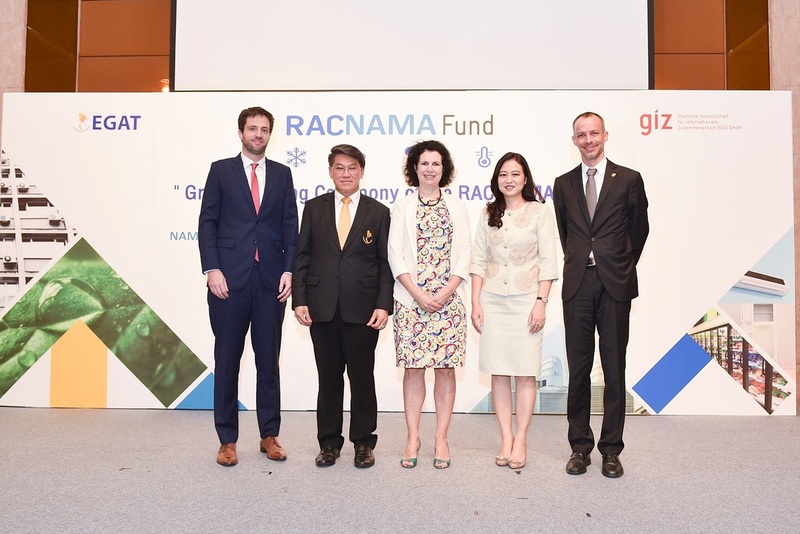 On 29 March 2018, the Electricity Generating Authority of Thailand (EGAT) and GIZ jointly organised the “Grand Opening Ceremony of the RAC NAMA Fund” to promote “Green Cooling Technologies” with high-energy efficiency and the use of natural refrigerants. Financial support mechanisms under the Fund have been thoughtfully developed not only to help reduce greenhouse gas emissions, but also to stimulate market opportunities for green cooling technologies and enhance the country’s competitiveness in the growing refrigeration and air-conditioning industry. “The Fund has two components. The first, a ‘Sub-Grant scheme’ of approximately THB120 million is designed to support production line conversion, testing equipment and training facilities. The second, the ‘Revolving Scheme’ of approximately THB 200 million will be utilised for market penetration, aiming to encourage both private households and commercial end-users, such as SMEs, to use green cooling products.” Mr. Kodshayut added. Mr. Jan Scheer, Minister and Deputy Head of Mission, the Embassy of the Federal Republic of Germany mentioned about the international cooperation between Germany and Thailand which has developed strongly for more than 60 years, and as part of that, the Government of Germany is committed to further supporting Thailand in its climate actions. He also saw the UK-German NAMA Facility Programme as a great benefit for Thailand. The RAC NAMA Fund is another fine example of know­ledge transfer and joint project implementation and will help transform Thailand’s cooling industry and market into energy-efficient, green cooling technologies. “We would like to express our sincere gratitude to EGAT for their courageous initiative in taking the leading role in the RAC NAMA Fund. EGAT is considered the most capable and suitable organisation for this role in terms of capacity and human resources, as well as experience in managing greenhouse gas mitigation and energy efficiency programmes, which include the successful Label No.5 programme. GIZ will take on a supporting role in the technical cooperation, technology and knowledge transfer, as well as in connecting Thailand with wider international cooperation. The RAC NAMA Fund will be a great example of innovative financing mechanisms that successfully address climate change.” Mr. Mahler added. The ‘RAC NAMA Fund’ comes under the Thailand Refrigeration and Air Conditioning Nationally Appropriate Mitigation Actions (RAC NAMA) project—the first climate finance project in Thailand funded by the NAMA Facility, a joint initiative of the Federal Republic of Germany and the United Kingdom, with a total value of 14.7 Million Euro (approximately THB 565 million). GIZ has been commissioned to implement the project in partnership with the Thai government. The main implementing partners are the Office of Natural Resources and Environmental Policy and Planning (ONEP) and the Department of Alternative Energy Department and Efficiency (DEDE).